The "Open with Windows Explorer" option on a document library does not open Windows Explorer. One of the really cool features on a SharePoint document library is the ability to open the library with Windows Explorer. 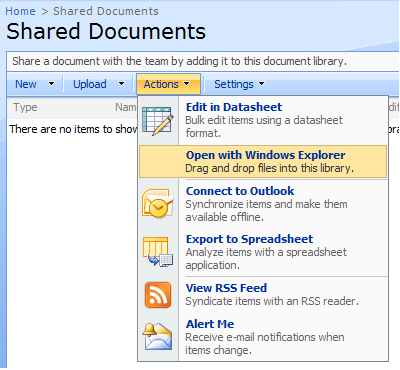 This allows users to easily drag and drop files from a network share or local drive straight into SharePoint. 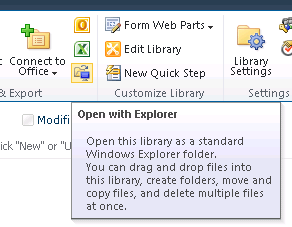 This shows the "Open with Windows Explorer" menu option on a Document Library. 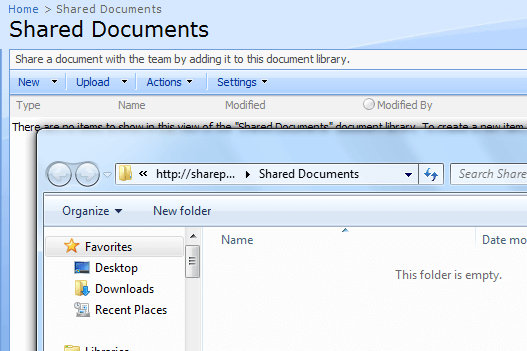 Here is the Windows Explorer window accessing a SharePoint Document Library. However, if you are using Internet Explorer 8 (64 bit), clicking the link from the Actions menu simply appears to do nothing. The solution unfortunately is to use a 32 bit machine until Microsoft adds support and an upgrade for Internet Explorer (64 bit) to a Level 1 supported browser. UPDATE: Microsoft has addressed this issue with the latest Internet Explorer Cumulative Security Update. LB97445 http://support.microsoft.com/kb/974455 Also note this article from www.ie8blog.com which refers to the same issue. 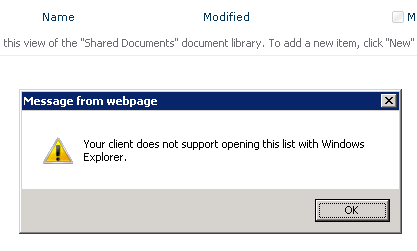 In SharePoint 2010 you do get a warning message stating your browser does not support this command which is a small step forward. For those of you new to SharePoint 2010 the "Open with Windows Explorer" option has moved to a small icon in the ribbon.